Author El Brown is a former military spouse, entrepreneur founder of KinderJam, a doctoral student, a change agent, and — the mother of an autistic son. Her new book, “Mama Bear” chronicles her journey, her personal and professional steps, and her quest to better the outcome for her child after his diagnosis. For those with special needs children, you’ll never forget the initial concerns, the diagnostic odyssey and the moment when you’re told your new role of Special Needs Mom. El has tackled tough mountains before, and this show shares a story of challenges and triumphs. “Mama Bear” will resonate with special needs parents, extended family members, friends — and for those who don’t realize the extent of the “Day in the Life” that parents of autistic children manage. An uplifting story to inspire and provide hope! 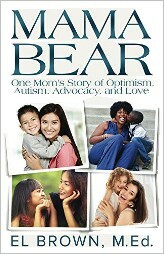 For more information, go to www.KinderJam.com, and find her book here: http://bit.ly/MamaBearBook. Click here to download the show http://bit.ly/ElBrown2, or click below to listen live. Also available on iTunes, Google Play, and Stitcher. Air date, 01Nov2016.